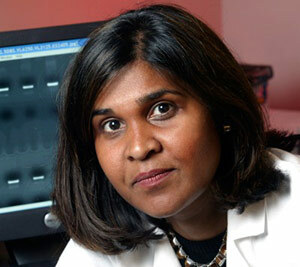 Pediatric HIV expert Deborah Persaud, M.D. A report presented at the 20th Conference on Retroviruses and Opportunistic Infections describes how an HIV-infected infant underwent remission after receiving antiretroviral therapy (ART) within 30 hours of birth. A report on the case is being presented on Sunday, March 3, at the 20th Conference on Retroviruses and Opportunistic Infections (CROI) in Atlanta. Johns Hopkins Children’s Center virologist Deborah Persaud, M.D., lead author on the report, and University of Massachusetts Medical School immunologist Katherine Luzuriaga, M.D., headed a team of laboratory investigators. Pediatric HIV specialist Hannah Gay, M.D., associate professor of pediatrics at the University of Mississippi Medical Center provided treatment to the baby. The infant described in the report underwent remission of HIV infection after receiving antiretroviral therapy (ART) within 30 hours of birth. The investigators say the prompt administration of antiviral treatment likely led to this infant’s cure by halting the formation of hard-to-treat viral reservoirs — dormant cells responsible for reigniting the infection in most HIV patients within weeks of stopping therapy. The researchers say they believe this is precisely what happened in the child described in the report. That infant is now deemed “functionally cured,” a condition that occurs when a patient achieves and maintains long-term viral remission without lifelong treatment and standard clinical tests fail to detect HIV replication in the blood. The child described in the current report was born to an HIV-infected mother and received combination antiretroviral treatment beginning 30 hours after birth. A series of tests showed progressively diminishing viral presence in the infant’s blood, until it reached undetectable levels 29 days after birth. The infant remained on antivirals until 18 months of age, at which point the child was lost to follow-up for a while and, the researchers say, stopped treatment. Ten months after discontinuation of treatment, the child underwent repeated standard blood tests, none of which detected HIV presence in the blood. Test for HIV-specific antibodies — the standard clinical indicator of HIV infection — also remained negative throughout. Currently, high-risk newborns — those born to mothers with poorly controlled infections or whose mothers’ HIV status is discovered around the time of delivery — receive a combination of antivirals at prophylactic doses to prevent infection for six weeks and start therapeutic doses if and once infection is diagnosed. But this particular case, the investigators say, may change the current practice because it highlights the curative potential of very early ART. Specialists say natural viral suppression without treatment is an exceedingly rare phenomenon observed in less than half a percent of HIV-infected adults, known as “elite controllers,” whose immune systems are able to rein in viral replication and keep the virus at clinically undetectable levels. HIV experts have long sought a way to help all HIV patients achieve elite-controller status. The new case, the researchers say, may be that long-sought game-changer because it suggests prompt ART in newborns can do just that. “Our next step is to find out if this is a highly unusual response to very early antiretroviral therapy or something we can actually replicate in other high-risk newborns,” says Persaud, who is also the scientific chair of the HIV Cure Committee of the International Maternal, Pediatric Adolescent AIDS Clinical (IMPAACT) network, a consortium of researchers and institutions that was critical in spearheading the earliest clinical trials of mother-to-child transmission and early treatment of infants 15 years ago. “Complete viral eradication on a large scale is our long-term goal but, for now, remains out of reach, and our best chance may come from aggressive, timely and precisely targeted use of antiviral therapies in high-risk newborns as a way to achieve functional cure,” Luzuriaga says. “Prevention really is the best cure, and we already have proven strategies that can prevent 98 percent of newborn infections by identifying and treating HIV-positive pregnant women,” says Gay, the HIV expert who treated the infant. The research was funded by the National Institutes of Health and by amfAR, the Foundation for AIDS Research. Report: D Persaud, H Gay, C FZiemniak, et al. “Functional HIV Cure after Very Early ART of an Infected Infant.20th Conference on Retroviruses and Opportunistic Infections.” Atlanta, GA, March 3-6, 2013. Abstract 48LB. Be the first to comment on "The First ‘Functional HIV Cure’ in an Infant"